it's undated, 60s judging by the illustration, logo etc., but the style says 50s to me. the pattern is unprinted, at which i also can't believe my luck, as it means i don't have to trace the bugger (my most hated sewing task). i'll be super careful with my cutting and all the marks can be easily transfered with tacks/snips without damaging the pattern. it says "5/8 inch seam allowance on all butterick patterns" on the instructions, which i assume means that the allowances are included but i'll do a little careful measuring to be sure. i like this tip about measuring collar and neck opening to check whether allowances are included or not. i'll be doing a little jigging about with this on the sizing and the style. 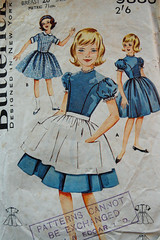 i want to make it usable as a sundress after the urge to be alice has passed, basically i want to be able to remove the peter pan collar and puff sleeves. i'll check the construction to see if there's an easy way to do this. i'm tempted to finish it as a sundress and simply tack on collar and sleeves - i think finishing the neck and sleeves while it's still flat will be easier and neater. i'm not a huge fan of big facings but i don't think this would look right bound either, but on reading my vogue book of sewing (which i really should do more often!) i learned of the bias facing. i might even make life even easier by using bought tape rather than making my own.